Surface temps at 38 degrees. Another stronger series of weather systems are due in starting Friday, and the forecast is for it to remain stormy for the next 5 days. With temps dropping below freezing at night, you can bet there will be additional snow covering most of Northern California. 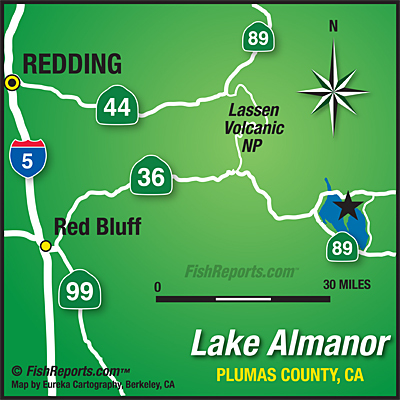 If the Almanor Basin gets pounded with snow, and I believe it will, snow removal crews will be busy with the roads, and ramps will be about the last to get plowed. Check the weather and pick your spots, because if you can get out, the fishing is better than good. Rainbow trout, and lots of them, several over 3 pounds but most were about 2 pounds, nice clean fish with the darker cold water colors. Trolling the east shore from Canyon Dam to Lake Cove and back should get a limit or two. Silver prism Needlefish, and the Seps Pro Secret, in silver. got all the attention, downrigged to 10 and 5 ft. with Pro-Cure Trophy Trout scent, lightly brushed on. If you cant get the boat out, Geritol Cove at Canyon Dam offers good bankfishing access, and the bite has been good also. Bait fishing, and jigs have been the best applications. The north fork of the Feather River is high and fast. and the Hamilton Branch is high and a little muddy. Even Bailey Creek is running already.